Moving is a lot of things: exciting, intense, stressful. But one thing that remains true for almost every move is this: there’s a lot to do. From packing boxes to finding a new place to researching the area you’ve chosen, it seems like the work of moving is never done until you’ve actually begun living in your new place. There is no truer example of the plethora of things that need to be done than deciding what to do with all your stuff. And we can already guess that you have so many things to deal with, which means there are countless decisions for you to make: namely, whether to give the items away, sell them, or keep them as you move on into your new home. Selling them is a great choice: you’ll be able to clean up some space, satisfy your friends and neighbors with new and useful items, and make a little money on the side. Although you can go sell items on Craigslist, eBay, or Amazon, the typical way of selling your things before an impending move is via a garage sale. These are an effective way of clearing off lots of things in one or two days—generally no longer than a weekend. But while they are convenient, moving sales aren’t necessarily the easiest feats to pull off. That’s why, in this article, we’re going to discuss the best practices of having a moving sale. These tips might just save you time—and make you a little more income. Organize when your moving sale will take place. This should be your first step, as it will determine your schedule for dealing with all of your unwanted items. In general, it’s good to hold a moving sale out over two days, although one day will do in a pinch. Choose Fridays and Saturdays for your sale. Sunday is usually more calm—people are more likely to be at home, spending time with their families, than on the road—and people are working for the rest of the week. Depending on the timeline of your move, you might be able to choose the season you’d like to hold your sale. In this case, choose autumn, spring, or, preferably, summer. If you’d like to have a winter moving sale, you would have to use the inside of your current home, rather than the outside, which would decrease your clientele. Most moving sales take place on the property of one’s home: usually in the front yard or driveway, but also, sometimes, in their garage. However, if you’re planning on selling many items—if you’re moving across the country or overseas, for example—you can consider renting out a space to sell your items. Many small community organizations and businesses will allow you to rent a spot for a reasonable amount of money, so do your research and find out which options are available to you. As for time, eight in the morning until five or six at night is a good time-frame for a move taking place on a Saturday, since these are the times when people will be moving through your neighborhood. If you’re hosting your moving sale on a Friday, however, you won’t need to get things rolling before eleven thirty at the very earliest. People are still working on Friday, after all, although lots of folks will finish around noon or one o’clock instead of five o’clock. Choose what to do with your items. Sorting your items is something you’ll need to do with any move, and it’s one of the most vital steps. To do this, make three piles: keep, sell, and give away. You can also split the “give away” pile into two: one for people you know, like family and friends, and one for charity. Once you’ve made these piles, start organizing your things, whether physically, with the items in your hands, or via a piece of paper. If you’re not sure whether or not you should keep a given item, ask yourself some basic questions. Have you used the item in the last six months? Do you intend to use it in the next six months? If the only true reply to these questions is “no,” then you already know the answer. Decide how you’re going to plan the layout of the area. Whether you’re using your front yard, garage, or place of business that you’re renting out, you only have a limited amount of space to work with. Because of this, you’ll need to carefully arrange that space and decide where everything should go. Take out a piece of paper and begin drawing out potential layout ideas. Make sure, while doing this, that you’re leaving enough space for categories which have more items. For example, if you’re giving away tons of clothes, you could use two racks, rather than one, to store them all. And speaking of racks, another important aspect of layout is what kind of structures you’ll use to display your items. Racks are usually a good idea for clothes, although placing them in folded piles on tables will have people rummaging through them, encouraging them to buy more in pursuit of treasure. Tables in general are also a good way to go: you’ll need them to store smaller items, such as accessories, movies, books, and video games. You can also consider using stacked-up crates or boxes to achieve the same purpose, provided that you make sure they’re strong enough. Cover them up with tablecloths as well: it will make everything look neater and more organized. Don’t forget to add some space for a folding chair or two, for you and whoever is helping you out with the sale. Moving sales often take place in the hot sun for hours on end; you don’t want you (or your friend) to be on their feet all day in that kind of weather. Also consider getting items for shade, such as umbrellas, or putting the cashier’s area under your tree. And while we’re on the subject of the cashier’s area, you’ll have to make sure that you have some installations set up—whether a cash machine or a money-box—so that people can pay for their purchases. Give your items reasonable prices. Remember, these are used items, and nobody wants to pay too much—no matter how high the quality might be. For inspiration, go to your local thrift store or consignment shop to get an idea of how they price their items. Also remember that it’s much better to use whole prices (that is, 1$ as opposed to 1.50$). This will make it easier to ring up everyone’s purchases. While you can consider allowing folks to haggle for your items, this isn’t something we recommend personally. It can lead into arguments—customers won’t always be happy with your final price—and will definitely take more time than fixed pricing. While it is true that it can lead to greater gains for individual items, it’s not guaranteed that you’ll make more money from the whole moving sale. Don’t neglect the bare necessities. We said this already, but it bears repeating: a lot of moving sales will be taking place in the hot sun. As a result, customers will start to feel dehydrated and sweaty, and—regardless of how much they’re enjoying your sale—they’re going to want to return home, in the shade. Counter this by providing them with refreshments. Ice-cold water is always a welcome choice, but lemonade will also be much appreciated as well. If you can spare the expense, whip up a batch of homemade cookies or other pastries; your guests will be surprised, but also delighted. Enlist your friends and family for help. Moving is tough enough on its own, but your friends and family can help. Have them help you out before the sale, by having them organize or price items, and during the sale, by having them work the cash and answer questions from customers. Be sure to reward them for their time by giving them pizza and a pick of any leftover items they want. They deserve it for their hard work! When the day comes, make sure everything is arranged properly. Have all your items up and ready for at least half an hour before the sale is supposed to start; you can never anticipate whether or not some customers will turn up early, and you don’t want to turn them down if you can help it. Stock your money-box or cash register up with cash for change; it would be terrible to, say, run out of nickels during rush hour. Place your items in the appropriate areas (use the layout plan you made earlier) so that there’s enough space for everything. If you’re going to be moving to a new place, then moving sales are a great way of clearing out your collection of things you don’t need anymore. You can help the community by providing them with useful items, and you’ll clear out on those items that you just have lying around, which are of no use to you anymore. You can even make a little bit of cash off a sale. 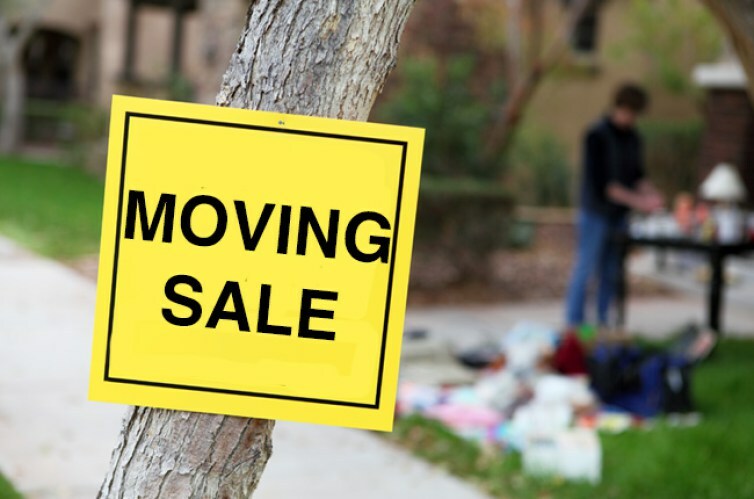 So, if you’re working on an upcoming move, consider the possibility of having a moving sale. Like customers who receive pastries as a thank-you for exploring a moving sale, you might find yourself pleasantly surprised.